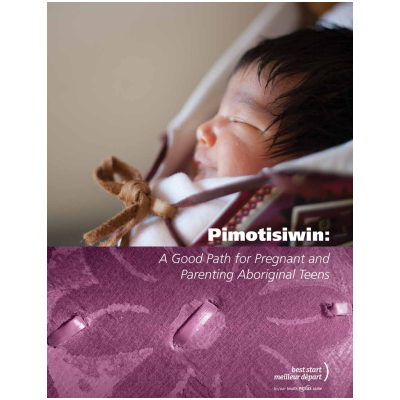 Developed in response to the high rate of Indigenous youth who are pregnant and parenting, and the disparities in income and health in Indigenous children and families in Ontario, this manual will help service providers in supporting Indigenous teens who are pregnant and parenting, as well as their children, so programs and services can be strengthened in a culturally appropriate manner. The resource also includes brief information about preventing teen pregnancies. The content is relevant to health care providers, early childhood educators, teachers, prenatal service providers, parenting program staff, and others who come into contact with Aboriginal teens who are pregnant or parenting. The resource may be most useful to non-Aboriginal service providers who want to strengthen their services for Aboriginal youth. The content may also be useful for new Aboriginal staff, providing an orientation to the prenatal and parenting needs of Aboriginal youth.